Georgette Bauerdorf, left, George F. Bauerdorf and Constance Ann “Connie” Bauerdorf Dillon in an undated photo, courtesy of the Los Angeles Public Library. Although Georgette Bauerdorf, 20, was living by herself in the apartment at El Palacio, 8493 Fountain Ave., in the weeks before she was killed, she was not entirely unsupervised. She had regular contact with her father’s secretary, Rose L. Gilbert, who lived at 6450 W. Olympic Blvd. 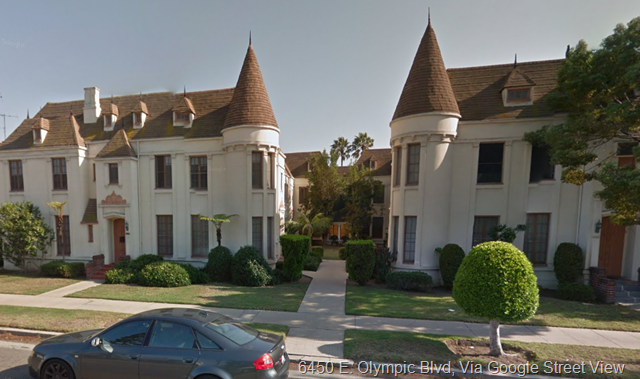 Rose Gilbert’s apartment, 6450 W. Olympic Blvd., via Google Street View. Wednesday, Oct. 11, 1944, was a pleasant autumn day in Los Angeles. We had the usual morning low clouds, warming up to a high of 75 after a low of 51. American troops were engaged in a fierce battle for Aachen, the first German city to fall to the Allies, and MacArthur was about to return to the Philippines. Aimee Semple McPherson’s family was fighting over her estate after the famed evangelist killed herself in September with an overdose of Seconol. And Americans were deciding whether to celebrate Thanksgiving on Nov. 23 or Nov. 30 after President Roosevelt moved the holiday in 1939 to add an extra week of Christmas shopping. On that Wednesday, the day before Georgette was killed, she and Rose Gilbert were together until 2 p.m., according to news accounts. They went shopping, had lunch and visited the beauty parlor. At some point, Georgette cashed a check for $175 ($2,365.01 USD 2014) and spent $90 ($1,216.29 USD 2014) on a plane ticket to El Paso, where she was to rendezvous with Pvt. Jerome “Jerry” Brown, whom she met in June while volunteering at the Hollywood Canteen. Georgette Bauerdorf’s appointment book, from the Los Angeles Herald Examiner collection, courtesy of the Los Angeles Public Library. Oct. 20, 1940: The Ann Meredith hair salon, 250 N. Canon Drive, Beverly Hills, with 56 booths, a snack bar and a men’s department with a separate entrance. It was replaced by offices about 1957. This entry was posted in 1944, Architecture, Cold Cases, Crime and Courts, Hollywood, World War II and tagged 1944, architecture, Beverly Hills, cold cases, Georgette Bauerdorf, hollywood, World War II. Bookmark the permalink. This is great stuff, keep it coming! So Roosevelt’s responsible for Christmas starting in AUGUST now?! He’s got a lot to answer for.